Somewhere in between THE A-TEAM and ESCAPE FROM ALCATRAZ lies the Sylvester Stallone prison break for hire franchise, ESCAPE PLAN. In the latest installment, ESCAPE PLAN 2: HADES, structural engineer Ray Breslin (Stallone) teams up with former rival Trent DeRosa (David Bautista) to rescue his team. When Ray discovers where his team is being held he reaches out to Trent, a mercenary working in hostage recovery and Bug (Pete Wentz) a notorious weapons dealer to rescue his comrades and save Yusheng. In order to complete the mission, Ray must break into Hades a prison known as the Land of the Dead. Director Steven C. Miller is easily one of the most prolific filmmakers working in the action genre today. With 15 credits to his name in 6 years, he is consistently turning out throwback spectacle that would have felt cozy on the shelf of any Blockbuster in the late 80's. 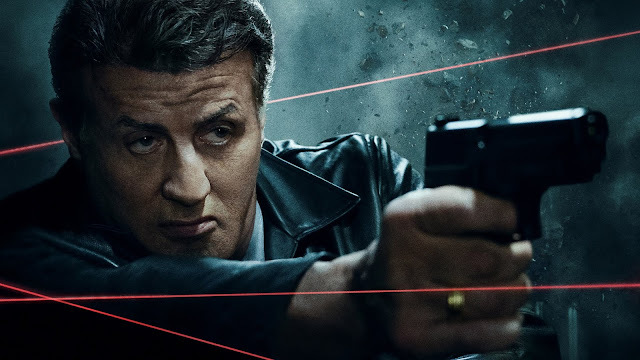 With ESCAPE PLAN 2: HADES Miller has infused the action tropes of the 80's with stylish camera work and innovative fight choreography that confidently puts his own stamp on the genre. He clearly has a love for the things that have come before him but has the self-assurance to make his own mark. While most big-name actors seem to phone in their performances in direct to VOD action fare, Stallone feels wholly committed to making something special out of these prison break films. I can't detect an ounce of cynicism form any of the performers, it never feels like they are shrugging their muscular shoulders at the audience as an aknoledgement of the paycheck project they are involved in. And at the end of the day, all the stylish action and eye-catching camerawork won't mean a thing if the actors aren't on board. ESCAPE PLAN 2: HADES is by no means a perfect film, it is held back by limitations that were more than likely due to budgetary constraints, but there is an infectious energy to the whole thing that makes it an entertaining watch. If you are the type of viewer who likes to throw on COBRA or TANGO AND CASH once every couple years, I think you'd find this latest effort from Miller and Stalone to be an enjoyable experience.